Setting: Uhuru Market in Kenya after Independence. The playwright portrays several issues that led to protest which is the major theme of the play though there are also other themes. The author shows that the colonial legacy has been the source of different problems which lead to dissatisfaction and later cause protest. The colonial impacts are like land alienation, introduction of new culture like dressing style of the white people, establishment of town life associated with so many social ,economic as well as environmental problems. The people lived in classes such as few enjoy the high living standard while the majority are starving or living the poor life and the minority seems to be neglecting the majority. The playwright also shows that some of freedom fighters are arrested and sent to detention camps, like the shoe maker. The shoe maker says ”I was arrested and sent to Monyani.... A concentration/detention camp.” The stranger is also arrested and sent to a detention camp who is shot dead. Despite those expenses in the forest that involved arrest and death of some people, the freedom fighters do not give up. The fighters also expect to live a good life after the independence. The freedom fighters have illusion/hopes that after getting independence they should get jobs, good houses and their land. After independence the new government of our fellow black leaders betrays the masses/people especially the freedom fighters. The minorities (leaders) took the opportunity and begin to enjoy the national cake (wealth). Those who have been involved in the struggle for freedom, like the shoe maker and the stranger, are left to suffer and hence living a poor life. The shoe maker is earning his living by repairing shoes and stays in the slum. Also the families of the heroes who died in the forest, like Njong'o and her daughter, suffer terribly. They have decided to engage in petty(small) business of selling soup so as to be able to survive in the slums. The playwright goes on showing the living conditions in the slums (shanty towns). The people in the slums at Uhuru Market are in poor conditions, the environment is filthy(dirty) and the government has forgotten them despite the important role played in fighting for Uhuru (this is betrayal). Bad enough, the government want to demolish or destroy their shanty/slums by saying that the place is dirty and looks filthy in the eyes of the visitors (tourist) who come from metropolitan countries. This is betrayal and humiliation since the government has done nothing to help the majority and it has abandoned them, leaving them suffering while they drive expensive cars. Yet the government goes on with the move to demolish the slums without showing them where to go and settle. This is humiliation or dehumanization of highest level. The playwright also shows that people in the slums keep on drinking and fighting. The city is full of people who cheat other people, especially young men, cheating girls, abandoning them and later they throw them in the trenches and live them to die like animals. In the slums, there are informal activities like food vending (Njongo is selling soup), making jembes and pangas by Tinsmith and repairing of shoes as shown by the shoe makers. There are problems of unemployment and poor living caused by poverty. Example Njongo and her daughter are sharing the floor as bed. The slums/shanty are made of poor material such as cardboards and rotting tins. The government has shown brutality against the people by implementing the discussion so fast without giving time to people to organize themselves so that they can move comfortably. She is the central character of the play. She is the mother of WANJIRO. She is a widow since her husband was killed in the forest during the MAU MAU movement. Her house is made of cardboards and she shares the floor with the daughter as a bed. She is tribalism for example she is against inter tribe marriages. She is abandoned by her daughter Wanjiro who decides to elope with Asinjo. She warns or advice Wanjiro to be careful with city boys. She is the daughter of Njango. She is naturally beautiful but not smart due to poverty. She has not been sent to school due to her brother. She loves ASINJO and wants to marry him but she faces protest from her mother. She helps her mother in domestic activities like fetching water sweeping, selling soup. She is unhappy with the poor life of living in the slums and wants to go with ASINJO. She admires wearing like white people and walks like European lady. She finally goes to marry Asinjo. He is an activist who does not live in the slums. He conscientious people about their rights and makes people/slum dwellers aware of humiliation, exploitation and demolition of slums. He is aware that in order to succeed, there should be strong determination, organised struggles and unity. He is courageous since he remained alone when others ran away until is arrested by the police officer. For making people to be involved in violence and civil disobedience. He is one of the slum dwellers. He is illiterate and never knows about his age. He is married to one wife with five children. He was among the freedom fighters in the forest. He earns living through repairing of shoes. He protests against the new government's discussions to demolish the slums. He is among the slum dwellers. He buys soups at Njango's place. He believes in magic power and Thinks that the stranger can perform his magic. He is a coward. He tells the people at the meeting that the police are coming and cautions them that they have batons (guns). He is another person who buys soup at Njango's place. He also protest/complains about the price of soup to Njango. He believes that stranger has magic to save them. He is a coward, E.g he tells others to run and he runs away. He is also a slum dweller and buys soup at Njango's place. He also protests against slum demolition. He encourages people to accept what the stranger is says and stands firm. He is also courageous like the stranger. He works with the city council Health department. He reminds people in UHURU market to move away since the slums are going to be demolished in order to implement the the clean city campaign. He is not among the slum dwellers. He is among the few people who enjoy the National cake, living a good life. He helps in forcing the people to move from slums. He drives Njango out of her hut. He is a young man from another tribe. He loves Wanjiro and wants to marry her. He was chased away and insulted and chased away by Njango because she does not want him to marry her duaghter. He tells Wanjiro tha he is a Tax driver. He convinces Wanjiro to go away with him and ignore her mother claiming she is old and ignorant. He is also a slim dweller who lives in poor life. He is not sure of his age EG. He came to the city but does not remember when exactly. He tells the journalist that he has done many jobs including cooking, washing and sweeping. He cooked the for white people during the war and after the war. He has a terrible experience in his life that involved sleeping in shop-verandas, trenches and in public latrines. He reports different events in the society. EG. Government's decisions to demolish the slums, people's reaction against demolition of slums. He is among the people in the civil services. He arrests the stranger for making people to involve in violence and civil disobedience. A theme is the main idea or subject in the work of art. 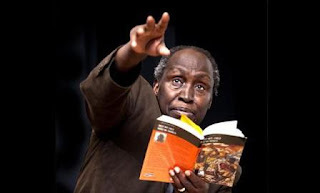 In “In This Time Tomorrow” by Ngugi wa Thion'go several themes can be analyzed and discussed. These themes includes protest, tribalism, poverty, betrayal, conflict, colonial legacy, building the future, illusion, disillusionment, social differences (stratification), awareness, environment sanitation, ignorances e.t.c. idea since it is unjust. In “This Time Tomorrow”protest is the central theme. The protest in the play is caused by dissatisfaction that people have as a result of injustice shown by the government. Also some people protest against the new culture ways of life introduced by the whites. For example Njango protest the idea of Wanjiro of behaving like the European lady such as to have a hand bag, high heeled shoes. Others protesting against conservatism caused by ignorance of modern ways of life because of old age. For example Wanjiro tells his mother that she is old and does not know the ways of the world or the needs of a young woman. The majority of Kenyans decided to go to the forest to fight for freedom of Kenya because they were promised by their leaders that after independence they will have a good life, for example good jobs and good houses, as well as the land that had been taken away by the white settlers, but after the attainment of UHURU the new government betrays the people. For example one can see that the government has left the people to live a very poor life in slums without helping them. It is just the “chosen few” who enjoys the national cake while the majority are living in miserable lives and they lack hope. For example Njango's shelter is made of poor constructive materials that are cardboards and rotting tins. She is sharing the floor with her daughter WANJIRO as bed. Also the crowd betrayed the stranger by running away when they saw the police. For example the 2nd customer tells the people at the meeting to run away because the police are coming. Moreover WANJIRO betrays her mother by running away with ASINJO despite the protest from her mother. EG WANJIRO tells her mother that she is going away with ASINJO and that he is waiting for her. The government exercises humiliation to the people through implementing their decision to demolish the slum in the UHURU market. They are doing so without showing them the other place and giving them time to move out of the city comfortably. This indicate that how people feel humiliated by being forced to go away from their homes while they have not being given another place to live. It is mistreatment done by the government by making decisions without involving the majority who are going to be affected by the changes. Tribalism is another aspect depicted in the play, It is caused by conservatism among some people in the slums due to illiteracy or ignorances. Tribalism is seen when Njango refuses her daughter to marry ASINJO because he is from another tribe, so she does not trust him and after all he is not having a job. This indicates some deep rooted elements of tribalism existing in Kenya and other countries. This means the lack of knowledge or information on a certain thing. The problem of ignorance is seen when some of the slum dwellers can not read and write and also cannot tell when they were born. Also the stranger gets a problems in making people understand him when he tells them. “let us stand together” Because of their ignorance they believe that the stranger can perform his magic to save them. 2nd customer, “yes the stranger's magic save us” this also shows ignorance because people believes the stranger can prevent the government from destructing their houses by using magic. This is shown by WANJIRO who desires to wear and work like a European girl. For example she likes to dress like whites, wearing high heels shoes and to have a hand begs. This is the act of protesting change or new ideas. Njango is conservative in the party, for example she prevents her daughter from marrying a man from another tribe. Wanjiro and Asinjo take her to be an old woman who does not know the needs of a young women in the modern time. This shows that Njango is ignorant and hence conservative, as she does not change with time and this is contributed by the fact that she is old. People protest against land alienation. The land has been taken from them during the colonial time in Kenya. They then decided to go to fight in the forest so as to get back their independence and regain their land that has been taken by the white settlers. Even after achieving independence things have not changed, the majority are still landless. The land is in the hands of the few. Therefore this shows that the majority are not owning land, except for the few who are in the government. Disunity has also been portrayed in the play. People are not united, that is the reason why they fail in attaining their goal of stopping the government from demolishing their slums. This is seen when the stranger tells the people to stand together and protest against the city council's decision to demolish their slums. At first they seem to be together but later, in the face of the police they are seen depressing. The playwright shows us that, still there are colonial elements in the country, especially among the members forming the new government. People do not see changes even after getting UHURU they are jobless and the land has not been given to them as they were promised. The minority are the ones who enjoy the national cake, as they are seen driving expensive Mercedes Benz and long American cars. This is a struggle or action by an individual or community to bring changes in life. The struggle was through Mau Mau movement so as to get independence and regain the land from the white settlers. Building the future at family level is shown by Njango who sells soup. She struggles to make sure that they get the necessary requirements of life. In any struggle the secret for success involves strong determination , courage, patience, and unity. If these aspects lack, then there can be failure. Failure in the struggle occurs when people are not united,determined, when there is ignorance, cowardice and lack of weapons. Illusion is a false idea or belief about somebody or something. For example, in the play, the freedom fighters had illusion or expectation that after the attainment of independence they would be given good jobs, houses and their land. But it is not the way they have been thinking. Things have become quite opposite to their expectation. For example the stranger says “we fought for UHURU because we were told it would mean decent jobs and decent houses.” The expected situation is not realized since after independence people have been suffering, no jobs, no lands and even no good houses. Another example of illusion is shown when people believed that the stranger have the magic power to save them while in reality it is not true. For example the 1st customer says “why don't we held a meeting with the stranger? He works in magic. Will he not blind their eyes?” but it was not true that the stranger worked in magic but he was insisting on unity. It is a state of being disappointed with a situation or by someone you thought was good or helpful to you. In the play, disillusionment is shown when people are disappointed by the new government created after independence. It is no longer giving them hope because it has betrayed them. They are suffering in slums but leaders don't care. They are just living in luxurious lives with expensive cars. This shows that they are disappointed and have no confidence in the new government. After independence, the minority seem to enjoy the national cake (those in the government position). They are seen in expensive cars and live in good houses in the city. On the other hand, the majority are living a poor life in the slums, doing petty jobs in order to survive. Also social differences/stratification is seen in places of living, for Example European lives in Kolo, Westlands and Kabete, where rich Africans have built good houses. On the other hands the majority are living in the slums. This statement indicates sound stratification and segregation which is taking place even after UHURU. The playwright has portrayed poverty in the play. The people in the slums, the majority who have been fighting for independence are living a poor life. They engage themselves in informal petty activities and their houses are shanty. Njango's house is made of cardboards and rotting tin. She share a floor with her daughter as a bed. This shows that the family is so poor that they can not afford buying good clothes. The poor life make people feel that the government has neglected and hence they are not having any hope. The “filthy mushrooms” symbolizes the dirty slums, therefore this shows that in places where poor people lives the issue of sanitation is not considered. Awareness refers to the state of knowing that something exists and is important. Knowing about the situation and it's positive and negative impacts. For example, someone can be aware of the importance of education, effects of tribalism and the significance of unity in the struggle. Asinjo is aware that tribalism is a problem, it can bring problems in development or changes. He knows that tribe is no longer a problem in marriage. Njango also shows awareness on problems that face women in town who takes decision like that of Wanjiro of running aways with boys. Girls are facing the problem of not being sent to school. They stay at home doing domestic activities while boys are given the chance to get education. Prostitution takes place because of poverty and unemployment which makes girls start selling their bodies. Reffers to the misunderstanding, clashes, quarrels between people due to some differences in interests or ideas. Conflicts can lead to disunity, enmity and underdevelopment. It can also lead to positive changes, such as it can change the nature of treatment that people get in particular place by their government. a) Conflicts between the slum dwellers and the city council. The slum dwellers and the city council are in conflict because of differences in their interests. The slum dwellers want to stay in the slum while the city council want the slum to be demolished so as to clean the city. b) Conflicts between the young and the old. There is a misunderstanding between the young people who after the modern life and people like Njango who are still conservative. The differences in interests leads to misunderstanding, for example Njango dislikes dressing like white people while her daughter does. Another conflict occurs when Wanjiro tells her mother that she wants to marry Asinjo, A man from another tribe. This annoys her mother but also Wanjiro is not happy for her mother to prevent her. Another conflict occurs between Njango and her daughter (Wanjiro) because of oversleeping. Njango is not happy by the way her daughter sleeps too much that she is even snoring. Another conflict between Njango and Wanjiro rises over the issue of school, clothes and bad language used by Wanjiro to her mother. Conflicts between the police officers and the stranger. The police officer is in bad terms with the stranger because he makes people to be involved into violence and civil disobedience. Hence, the police officer arrest him by saying in the name of our new Republic, You are arrested. Wanjiro is unhappy with the state of not going to school while her brother has gone. She is also unhappy with the poor life in the slums, where by she does not have good clothes unlike other girls in the city. She wants to be with Asinjo but her mother is preventing her. So poverty in the slums makes Wanjiro hate living there and she wants to move from that place. Refers to the lesson that one can learn after reading a certain literary work. The government should decide properly when it wants to make a decision so as to avoid/prevent creating problems to people. It is very important to involve people when making decision and their views should be considered. For example the city council was supposed to consider the views of the slum dwellers before demolishing their slums. Another lesson is that, success always goes to those who struggle. The importance aspects when struggling for success are self determination, unity and patience. Tribalism, ignorance and cowardice are great problems that hinder the attainment of certain goals. So one needs to be very careful when trying to bring some changes in the society. Education is an important tool in bringing changes in the society. People in the UHURU market are not ready to write because of ignorance and they don't know why they should write. They have poor believes based on magic power that it can help them while it is not true. All these are due to low level of education. Another lesson is that the young should listen to the advice of the elder since they have enough experience and good wisdom. Making decisions based on personal desires can lead someone into problems. For example the decision of Wanjiro to run away/elope with Asinjo was a dangerous one. Also we learn that the government is always strong, because it has the machinery to enforce or implement their decisions. Therefore people or citizens cannot easily succeed on fighting it. There fore it is good to use the diplomatic ways of facing the government because the use of force can lead to the loss of life and property. Also the government should not make suddenly changes that affects people without involving people. Rural-urban migration has led to the emergence of people who are not employed.